While Windows is running, check the Device Manager to see that it is clean (no question marks next to devices). Shut down computer and unplug from wall. Remove the cover to your computer's case. 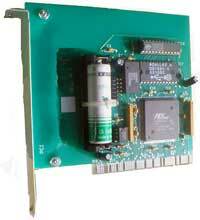 Place the PCI Real Time Clock into an empty PCI slot. Since the card is Plug 'n Play there are no jumpers to set. Information for installing ClockCard in a PCI Express slot. Complete installation involves installing the physical card in the computer, installing the card driver software for Windows, and installing the ClockWatch application software. Turn your computer on and allow Windows to load. The Windows New Hardware Wizard will detect the PCI Real Time Clock as a PCI System Peripheral or a Base System Device. Select the "Search for the best driver for your device" option. Make sure the CD-ROM drive option is checked. Place the provided CD-ROM in the drive. When prompted by the New Hardware Wizard for the driver location, select your CD-ROM drive. Check Specify a location and press the Browse button to browse for the driver. The driver is usually at D:\ClkCard\Drivers\Drivers\Win98 on the ClockWatch CD. Windows will then install the driver: RTC WinRT WDM Device. This is the device driver for the PCI ClockCard. The device will be listed as WinRT Devices>RTC WinRT WDM Device. Verify that the device is working properly by selecting the device and viewing its properties. Turn your computer on and allow Windows NT to load. account or a Windows NT domain administrator account. Place the provided CD-ROM in the drive. From the start menu, select the Run... option. Enter the command X:ClkCard\Drivers\install.bat and press the Enter key, replacing X with the drive letter of the CD-ROM drive. The necessary software to operate the ClockCard is now installed for Windows NT 4.0. See Operating Instructions for steps to set the time. In most cases Windows will detect the PCI Real Time Clock as a Base System Device. Select the Search for the best driver for your device" (2k) or Install from a list or specified location (XP/2003) option. Make sure the CD-ROM drive option is checked. New Hardware Wizard for the driver location, select your CD-ROM drive. The device will be listed as WinRT Devices-RTC WinRT WDM Device. Open the Device Manager, which lists ClockCard as: Other Devices>Base System Device. Click the "Properties" on the Base System Device. Place ClockWatch CD in CD-ROM and chose "Install Software Automatically"
Wizard then installs the driver and finishes. Normally the Real Time Clock service is run in sequence with the ClockCard installation script. If already installed, there will be a entry under Real Time Clock under the Windows Start menu. Choose Setup.exe from the ClkCard\Drivers Directory on the CD. This will start the Real Time Clock Service Installation. This will install the service and necessary support files. Reboot the computer at the conclusion of the installation. Select the Real Time Clock> Real Time Clock Setup from the Start menu. Open the RTC service configuration by double clicking on the red clock face in the task bar. Press OK. The Service should now be initialized and should maintain the time, even when changed from the Windows Date/Time applet. If the initialization fails, you may need to manually stop the ClockWatch Service and start the RTC service to set the local date/time and offset. After initialization, you can restart the ClockWatch service. Start or stop the service under the Windows Service Manager (Admin Tasks>Services). Open the RTC Service to administer. Unpack the receiver, data cable and power supply. Locate the ClockWatch CD-ROM. Locate the clock near the computer. The clock gets its power from the external power supply (included). The green LED should light when the receiver is powered and the switch is on. Connect the clock to the computer serial port using the included DB-9 connector and data cable. Verify that the connectors are plugged into both the serial port and the clock. If necessary, the address used by ClockCard can be set to an address which doesnt conflict with other devices in the host computer. The ClockCard is shipped from the factory set for D000h. If you need to change this address, select one which will not conflict with another device in the host computer. The on-board jumpers allow selection of one of six discrete addresses in the range of C800-DC00. 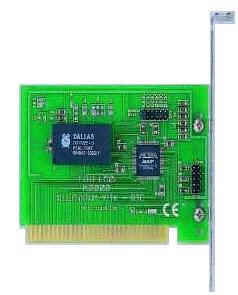 The Beagle Software ClockCard is an 8-BIT adapter card that may be installed into the 8-bit portion of any ISA, EISA or VLB (Vesa Local Bus) bus slot. Optionally, you can connect one of the LEDs (for example the Turbo LED) on the chassis. To do this, take the wire from the LED and connect it to the pins marked "JP3" on the ClockCard. Note that you must connect the LED the right way around. If in step 8 the LED on the card starts to flash, but the external LED does not flash, then you have connected the LED the wrong way around. Reverse the LED cable. Switch the computer on. You should hear a beep as the computer starts, and a message on the screen should appear to indicate ClockCard is working. The LED on the ClockCard should start flashing. If you connected one of the LEDs from the chassis to the card, it too should start to flash. Switch the computer off and then close the case of your computer. Your computer is functioning properly and the ClockCard is now active. Install the ClockWatch software from the CD-ROM, choosing the ClockWatch options to match your edition order (i.e., Pro, Sentry or Server). Reboot the computer and test ClockCard by opening the ClockCard test screen (Options>ClockCard>Test) in ClockWatch. Enable ClockCard as a time base under the ClockCard options tab (Options>ClockCard). Set the Real Time Clock's time by clicking the "Set Time" button in ClockWatch, which will check and set the the time on ClockCard. Any attempts to change the time without using ClockWatch will be reset to ClockCard's time within 10 seconds. Any other deviation in time will also revert to ClockCard's time within 10 seconds.